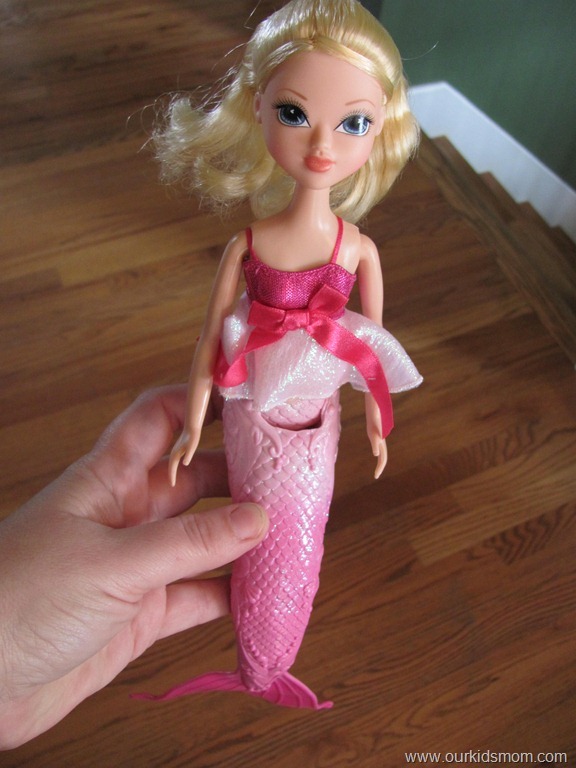 A swimming mermaid doll that every girl will love. This gorgeous doll captures the magic of mermaid fairytales. With her beautiful hair and glittery tail she is sure to enchant your little one. Just place the doll in water and her arms and tail will begin to move. My kids a really into mermaids right now. 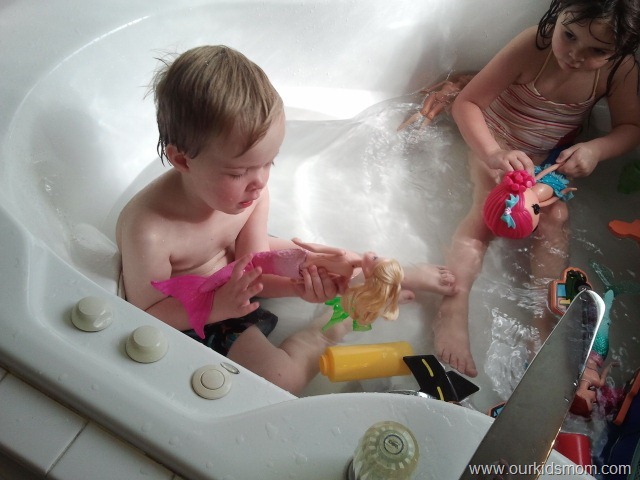 Ethan especially likes them because they can go in the tub and this one in particular has long blonde hair. He likes dolls but has a specific preference for blondes… go figure. I love Moxie Girlz because of their positive message. This beautiful little girl/mermaid’s name is Avery. She has pretty flowing blonde hair, a cute sparkly halter style swim top, a posable body and a glittery rubbery tail. Avery is not only pretty to look at and fun to play with in the water… she actually moves and “swims” when wet with the help of two AA batteries (not included). Ethan’s eyes lit up when I took Avery out of the box. He immediately begged to play with her in the bathtub. He was a little freaked out at first that she was moving without him doing anything. I think he thought that she was broken because the “motor” in her tail to make her move is a little noisy. Once I told him to let her go and watch he was both intrigued and excited. As you can see, Ethan was mesmerized by Avery and kept staring at her. He loves a pretty girl and Avery has won his heart . I think he’s going to have a blast with her in the swimming pool this summer! 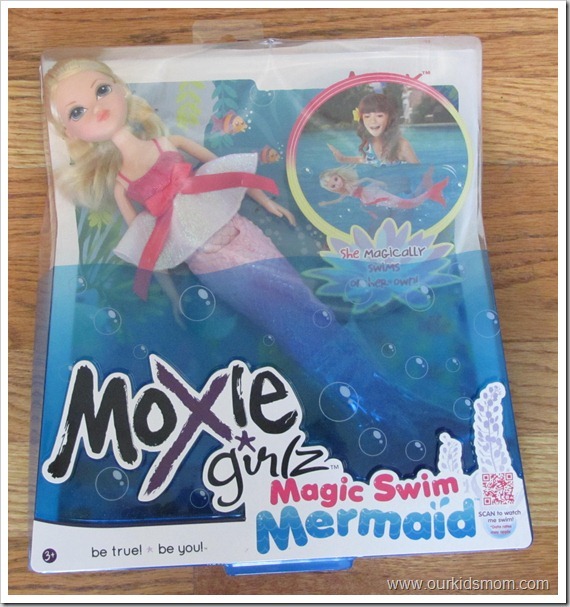 You can purchase Moxie Girlz Magic Swim Mermaid for $24.99 from Little Tikes. 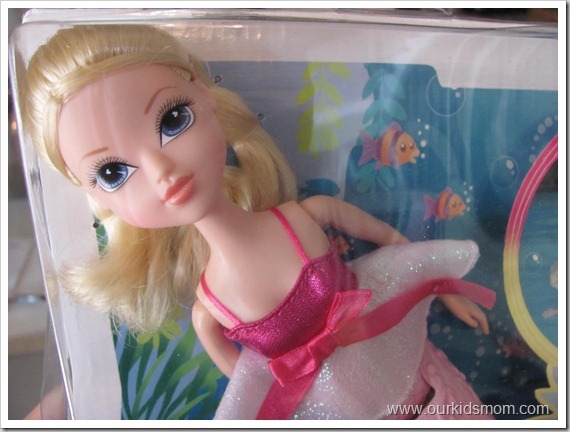 ONE OurKidsMom is going to win a Moxie Girlz Magic Swim Mermaid Doll! This giveaway ends at 11:59 PM EST on April 27, 2012. I would love one of the mermaid dolls.. My niece would love to have one and i would love to be able to give it to her. Thanks for such a good giveaway. I like the Kellan doll, she has red hair just like my granddaughter! Moxie Girlz FFM Hair Makeover Torso- Lexa I think my daughter would love fixing her hair and make up! 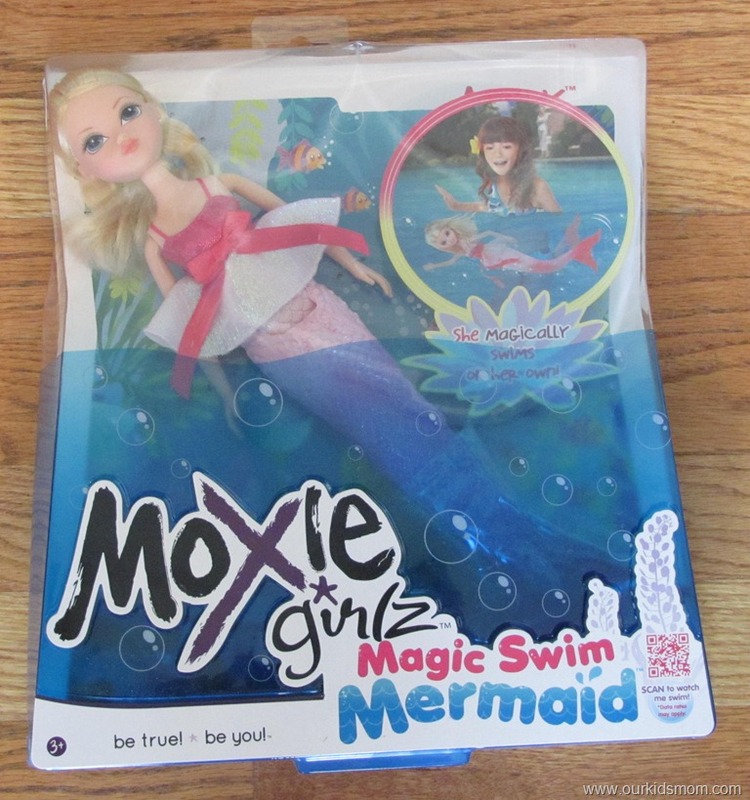 My daughter has seen the new Moxie girl commercial & has been asking for the new mermaid doll! I bet my little girl would love the toy horse and stable! Love the winter sets they put out for the dolls. I love their message. It encourages girls to be strong and be themselves. I loved the TrueHope cancer benefit dolls. This is an amazing step towards dolls for kids and sick kids, and family memebrs of sick kids. 🙂 Ty for this wonderful giveaway! I would love to have the Moxie Girlz Glitterin’ Style Sophina for my niece, who is biracial. I think she is a good match! 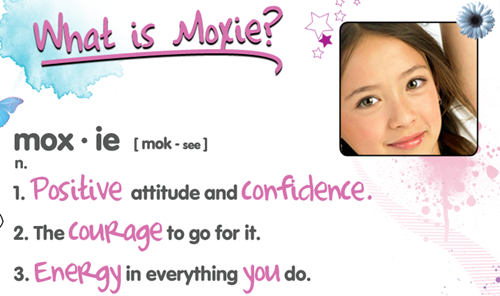 I like that Moxie girl represents positive attitude and confidence, every one should learn these traits! I love the descriptions of the dolls. It really encourages individuality and friendship. I would love to get Moxie Girlz Ballerina Star Avery for my niece! I like that there’s a doll named Avery! That’s my daughter’s name. Thanks for the chance to win! I want to get Moxie Girl Sophina as well for my daughter! Daughter LOVES Moxie Girls and Bratz! She would LOVE this! Thanks for the opportunity! Moxie is coming out with bald dolls! This is LONG overdue! Love the true hope dolls. my niece would love the toy horse and stable! I learned there are screensavers, wallpapers and games on the site. I like the Moxie Girlz Laptop. 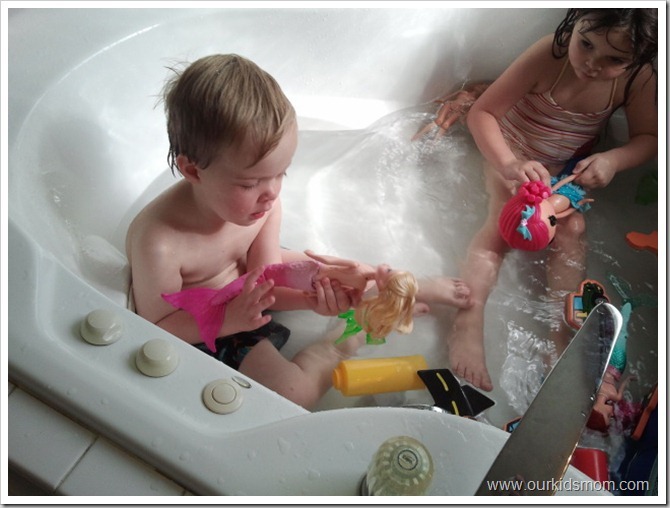 I love the fact that the dolls can be used in the tub. i love that they are making bald dolls for cancer awareness. I love the True Hope Dolls! My daughter would love the horse! I like the Moxie Girlz True Hope dolls that benefit cancer research at the City of Hope. My daughter is loving horses so the moxie riding club is perfect for her!!! I like the variety of cute dolls. Love the horse riding Moxie Girls! My daughter loves horses. my neice would love this doll to take to the pool or even just in the bathtub with her she loves mermaids! I like the Avery doll. I love the riding club- that will be a must have in my house!! Found the dolls that benefit cancer interesting. Would love to see those donated to a children’s hospital! The Horse Riding Club is another set my niece would really enjoy. I’d love to get my daughters a Moxie Girlz Sweet Style Lexa doll! I’m loving that they have True Hope dolls to benefit cancer research. My daughter would love the Moxie Girlz Art-titude™ Fashion Design Kit! I like the Moxie Girl Hope. I like the Lexa doll. 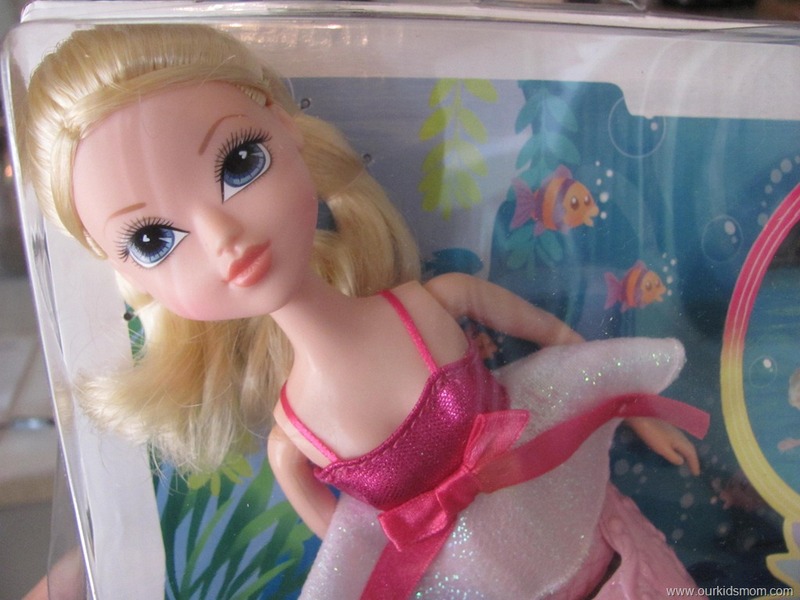 I like the ballerina star doll! My little Grand daughter would love the Moxie Girlz Glitterin’ Style Avery, she would really like her long blonde hair. The Horse Riding club game is cute! They have a doll that has no hair that helps with cancer research, that is pretty cool! I like that there’s a game you can play on their website. My daughter would also like Monet the horse riding club Moxie Girlz. I love the Moxie Girlz Me and My Sister – Avery. It would be so perfect for my nieces. Thank you for the great giveaways! My daughter would love any of the Moxie Girls, especially the Mermaid! I want to get the Moxie Girlz Glitterin’ Style Sophina for my daughter! i also like the horse riding club. cute! I learned there are Moxie girls for a Horse Riding Club…my daughter is an equestrian and would LOVE this. I like and want Kellan dolls! I like the lay out and colour is very nice, I also like avery dolls! my daughter loves everything to do with Moxie. this looks awesome that she can take her swimming! A great idea especially with the summer days approaching. Who wouldn’t want to play in the water with this cutie! This is a great tub or pool toy! I love the: What is Moxie Girl? Sorry, not for sure as to what happened. Moxie has lots of energy and courage. love love love the true hope dolls. also a great alternative to barbies! thanks for hosting. thanks for featuring this great positive doll for girls! My girls would love the stable and horse! I like the Riding Club Horse, Bingo. I also like the Moxie Girlz Art-titude™ RC Vehicle 27 MHz. I like the Moxie Girlz So Stylish Lexa Doll. I love the game choices they have to play! I like that they stand for courage and confidence. I would love to have the Sophina doll for my niece Sophie. She would be so excited since the baby has her name. The have a Glitterin Style Purse where they have pens for you to color the purse. My daughter would love that! I love the horse sets! The Horse Riding Club Monet doll would be fun too. I really like the little swimming Avery for my little mermaid Arial. She would love it, and I would love to get the Moxie Girlz Laptop, because she loves to get on mine. Thank you for the giveaway. The kids like to play the games on their site. I like the Moxie Girlz Horse Riding Club Monet. I like he lexa dolls most! I like the riding club doll Monet. My daughter would like her. my daughter really wants fairy bryten. My animal lover would love the toy horse and stable! I really like the Moxie Girlz Magic Snow RC Cruiser. My girls would also like the Stable & Horse set! I like the Moxie Girlz So Stylish. I think the Moxie Girlz Horse Riding Club Bingo is nice, too. Thanks for the contest! I adore the stable and horse, my niece is into horses . The Lexa Doll is cute. my dd like the bryten moxie doll.